The noctilucent cloud season in the Northern Hemisphere is in full swing. These clouds are named after the Latin for ‘night-shining’ because they are only visible after dark, when they shine out against the night sky as eerie, bluish ripples. This great example of noctilucent clouds was spotted just before 1.00am over Lossimouth in Scotland by Alan C Tough (Member 21,958). These clouds can only observed from higher latitudes – typically between 50° and 70° degrees latitude — during the mid-summer months. They are the highest clouds in our atmosphere, and by a long way. Also known as ‘polar mesospheric clouds’, they form at altitudes of around 80 km / 50 miles, in a region of our atmosphere known as the ‘mesosphere’. They are up near the fringes of outer space. Being so high, they still catch the light long after the Sun has dipped below the horizon and the lower atmosphere is dark. The mesosphere is the region above the stratosphere. It is an extremely cold and dry part of our atmosphere. Since this region is too high for weather balloons to reach and too low for orbiting craft like the Space Shuttle, it is one we know relatively little about. Noctilucent clouds, as a result, are a bit of a mystery. No one knows for sure how the cloud’s ice crystals form up where the air is one hundred million times dryer than that on the Sahara desert. It is possible that the ‘icing nuclei’ onto which the ice crystals form might be tiny specks of dust from outer space introduced into our upper atmosphere by meteors. 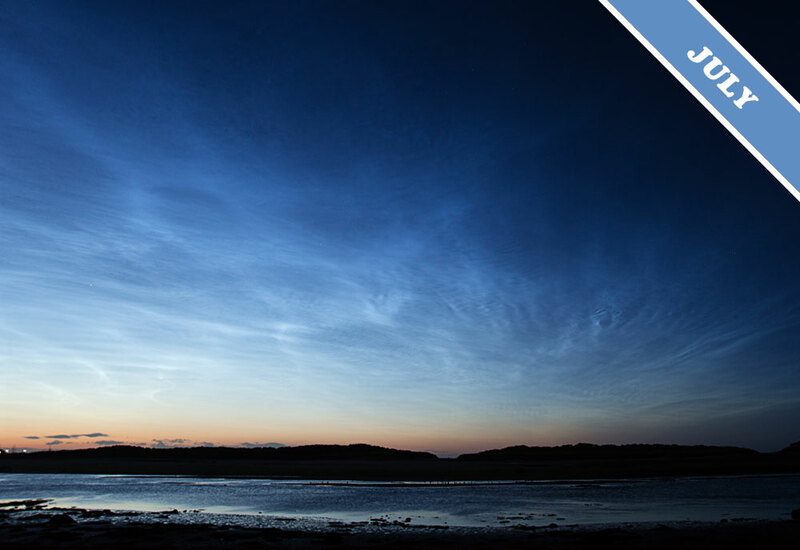 Noctilucent clouds spotted over Lossiemouth, Moray, Scotland by Alan C Tough (Member 21,958). 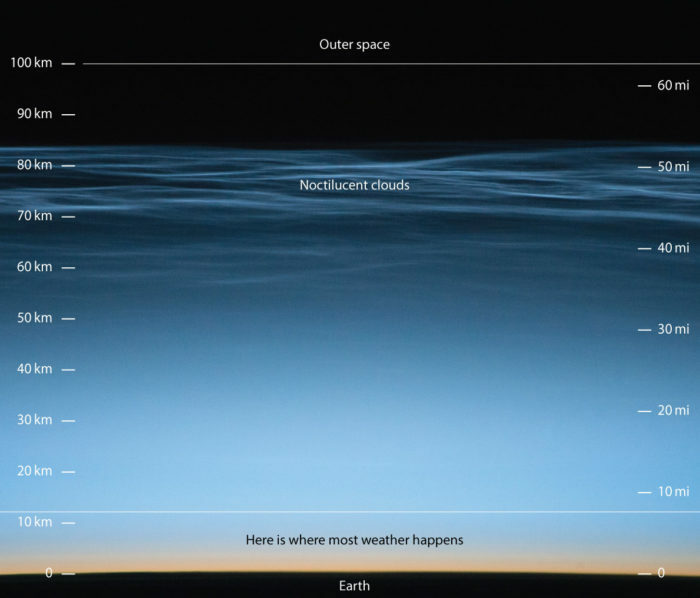 Noctilucent clouds form up near the fringes of space (which, by convention, we say is at 100km up). The ones in this photograph were spotted from the International Space Station by astronaut Jeff Williams. Many thanks, indeed, for the welcome explanation. Much appreciated. The photo taken by Alan C Tough is marvellous. Thanks, Alan! Fabulous clouds and such an interesting piece regarding them. Many thanks to Alan for the beautiful photo. I really look forward to my cloud of the day e-mails and they never disappoint!!!! !